1 Bedroom, 2 Bathroom Condo with 1050 sq. ft. Completely Remodeled and Beautifully Furnished Condo, located within a short walk to the beach. Lake town Wharf offers THE Resort style vacation, from the five unique pools, 52,000 square feet of lakefront boardwalk, a fully equipped fitness center, covered parking, miniature golf, an on-site market/bistro, on-site dining options and flexible meeting spaces for conferences, to weddings and other group functions. There is really no reason to leave, other than the beach experience you can find across the street. 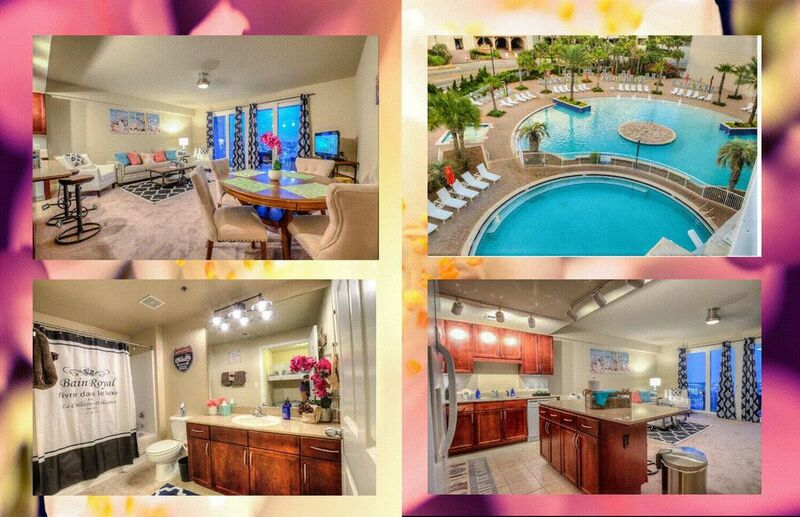 Phenomenal setting offering panoramic elevators, you cannot find anywhere else, heated pools, kiddie pools. Vegas style fountain show every night, you can enjoy from the privacy of your own balcony! The unit has been decorated extremely tastefully and no expense has been spared for the comfort of our guests. The kitchen is fully equipped with everything you will need. Themaster bedroom has an extremely comfortable King Bed and en suite Bathroom. The bunk area is secluded and has brand new mattresses and a private bathroom. The living area is extremely spacious and open, it offers a sleeper sofa couch and brand new furniture for he ultimate luxury feel. The condo is 1050 sq.ft and it is located in the best floor- 10th. RIght across the 10th level you will find one of the best pools in the complex, hidden away and extremely close, so no elevators needed to access it. ZIA specializes in creating exceptional memories for families and groups! Our detailed approach has helped us fit the right property with the right group, to guarantee the maximum enjoyment to all of our valued guests! Vacation time is a valued necessity and we will cater to all of your needs to benefit every minute of your time away from home! We had the best trip. The condo was exactly as pictured. Very clean, well stocked, and the owner was wonderful! Very responsive and attentive to all our needs. We even extended our stay by an extra night. We would definitely stay here again! Thank you for letting host your stay! You guys are wonderful and took an amazing care of our place. I would love to host your future trips. This place is amazing! The condo itself is great! It’s decorated so nice and new! Everything was extremely clean which was a bonus few sure. Also you can’t beat the location, the room is right off the elevator and right by the rooftop pool access! The walk to the beach is not bad at all, and being right next to pineapple willy’s is great because of those to-go daiquiris :) Also wanted to say that the property contact was very great, we had a little confusion about the check in process and gave a call and she answered immediately and helped us out. All in all a wonderful stay and will for sure be staying there in the future! We are happy that you loved the unit and the location, Morgan! Thank you for your kind words and we look forward to your next trip with us. This place is truly an amazing condo. It was perfect! You truly feel like you are at home. You are so sweet, Whitney! I am so glad you felt like home. We loved hosting you too. Convenient location; easy access to beach; loved the pool access on the 10th floor. Would definitely stay here again. Nice location and exceptional condo! We are glad to hear you loved the location and the condo worked out great for you! We cannot wait to see you next time you visit PCB. We just came back from a fantastic trip to PCB! Accommodation was perfect, the best declarations and extremely comfortable space! We will be back! Thanks. We are glad to hear you had a great time and the unit worked well for you!